In this months Infomail we will be delving into the murky depths of Health and Safety. We will be at the following planned event... come along for a chat, pick up some bargains and maybe even a free gift. This meeting will include a look at DMX with a hands on session. Mon 18th March 2013 @ 8pm Bristol informal DJ meet-up at The Willow Court Lodge, 209 Gloucester Road, Patchway, Bristol, BS34 6ND. Supported by AMPdj (who will be there) & Pro Mobile - come along for a chat - all welcome. Tues 19th March 2013 @ 8pm Bournemouth DJ meet-up at The Winchester, 39 Poole Hill Bournemouth, Dorset BH2 5PW. Supported by AMPdj, CD Pool, Rhino, Void Acoustics, SJ Hire, Brooke, Lanta, XtendaMix Europe plus Dorset Crime Prevention team giving advice on how to secure your equipment! - all welcome. 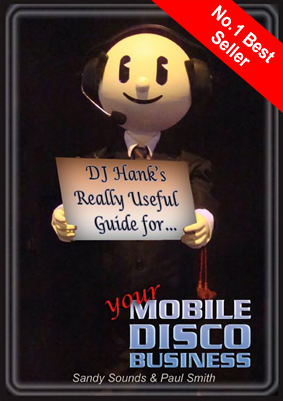 You can read what DJ Hank has been up to recently in the next edition of Pro Mobile magazine out in March and follow him on YouTube. So what effect will this have on your radio microphone? Most UHF radio mics sold in the UK (until last year) were set to either channel 69 (854 - 862Mhz) or channel 70 (863 - 865Mhz). Radio mics set to the channel 69 band will no longer work as the signal will be blocked out by the 4G traffic. It is likely that these will be re-tuned to channel 70, adding to the congestion. Radio microphones now sold in the UK are configured to work on the new 'shared licence' channel 38 (606 - 614Mhz). Thanks to AMPdj member Steve St John for supplying this information. "While on a ladder, never step back to admire your work."